Every picture tells a story – that of my constant battle with George, my cat, who despite having a perfectly good litter tray, insists on using any available square inch of soil as his personal toilet – and eating a variety of grasses. And I do mean every square inch. My raspberry bed and the tropical bed have been mangled and there’s not even that much bare earth. What to do? I love my cat, I love my plants. I don’t want to harm him, just make sure he stays away from the bare soil until the plants have put on enough growth to make it not worth the effort. I’ve been trialling two products – STV’s Defenders Cat & Dog Repellent Crustal Gel (it looks like a bottle of crystallised orange ketchup) and Cat & Dog Repellent Scatter Granules. The active ingredients are plant oils (orange and chilli), which animals dislike, in inert gel or clay. You must clean up the area first – any fouling, scratching or digging holes, so there’s no scent for them to return to. You simply scatter the contents around the affected area and repeat every 48 hours until they give up. Despite his monumental persistence, even George gave up after a couple of applications – but I continue to use it on bare soil, as we have a bit of a turf war with a new cat going on at the minute. For more details and stockists, log on to http://www.stvpestcontrol.com/4/1/Product/Defenders-Cat-and-Dog. 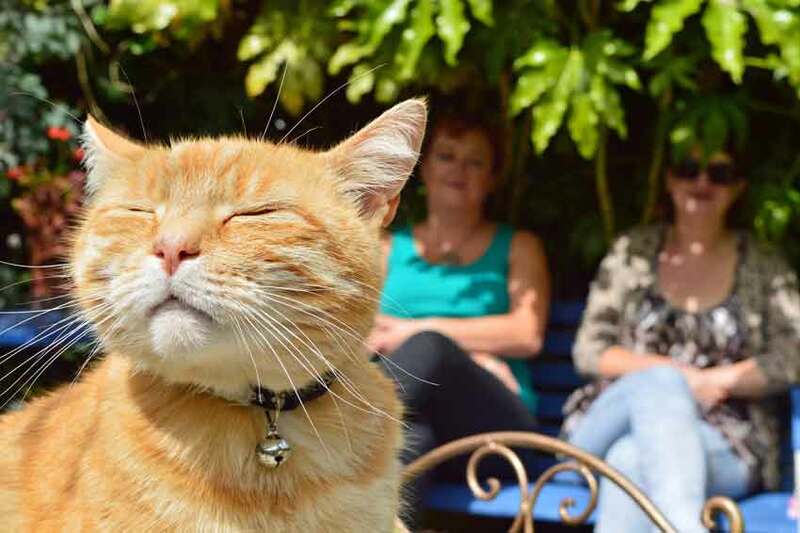 Even if you’re a cat lover, you can’t deny they can be a complete pest in the garden. Lucky George is a huge ginger tom who has failed to put a dent in the bird population because he’s a terrible hunter. However, I have threatened to skin him for his love of newly-dug soil – so how to stop them? 1. Ultrasonic cat scarer: He became accustomed to it and it drove my stepson insane, as he could hear it. 2. Spiny interlocking branches: Rose cuttings and Berberis darwinii work as long as they don’t blow away. 3. Flimsy plastic roll-up fencing: Place on top of a fence to prevent cats from climbing over it. 4. Taut wire/string fitted 10-15 cm above a fence-top: This makes it difficult for cats to balance. 5. Place half-full plastic bottles in borders: An old gamekeeper’s trick, as the light reflection is supposed to deter them. 6. Thread old CDs on twine: String them across beds or hang from trees. 7. Coleus canina: This plant, marketed under the names Pee-off and Scaredy-cat has a pungent odour that is said to repel cats and other mammals. 8. Scent deterrents: These will either serve to repel or mark a territory, or try orange or lemon peel. 9. Water pistols: Don’t aim at the cat – the noise of the water hitting a nearby bush should be a deterrent. 10. Surround an area with a chicken wire fence: Make sure it leans in the direction from which the cat will approach – it can’t climb over such an angle. I love having birds in the garden and actively encourage them, but there’s a couple of areas where they cause serious damage. One is the runner and broad bean patch – the resident pair of wood pigeons seem to enjoy wantonly tearing at the leaves/pods (I’ve seen them at it). The multitude of sparrows and dunnocks steal twine by the mile. Every bit from the runner beans and 40 sunflowers was pinched several times last year. This means crops flop over, leaving them more susceptible to slug and snail damage. The other problem is the loganberry/blackberry cross. These need to be picked daily – if not, the birds eat them and deposit purple poo everywhere. It’s a short season of keeping them away, but how? I trialled two products from STV – the Eyeball Bird Scarer – it’s basically a big yellow beachball with ‘eyes’ and streamers hanging from it. Despite its comic looks, the inflatable eyeball, when blowing in the wind, mimics in-flight predators to birds. Hanging between the beanpoles, it certainly kept them off the beans. The other deterrent near the hybrid berry is a life-size 14″ Falcon – it deters other nuisance birds and animals. There was far less of a problem with the berries – very little purple poo in evidence. The ‘falcon’ did fall out of the tree at one point and hung upside down for a day, so you can forgive the other birds for thinking it was dead. The best thing is that these two deterrents are area specific and the places I wanted protecting were nowhere near the bird table, so it didn’t affect the other birds. Also, the birds return as soon as the eyeball and falcon are removed, so no harm was done.